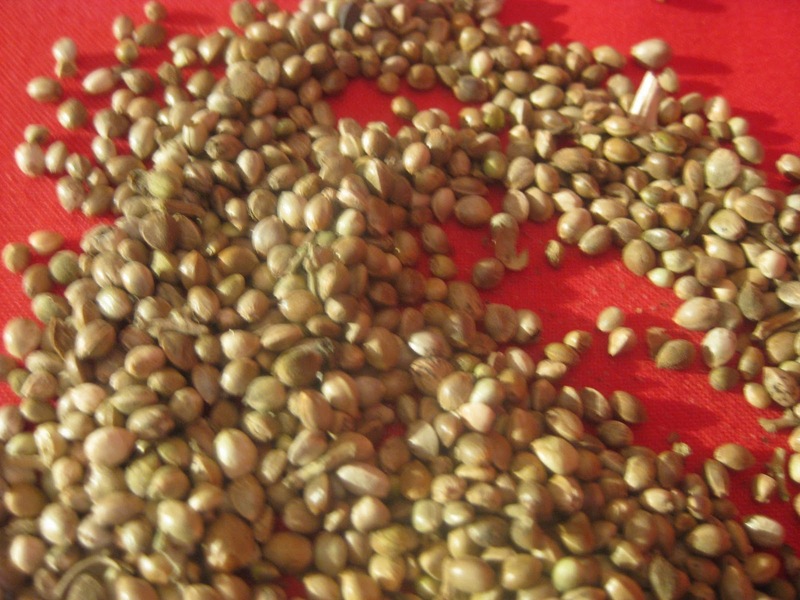 cañamazo, hempseed. This is one of the most nutritious health food there is as it contains protein, essential nutrients, many vitamins and essential Amino and Fatty Acids. 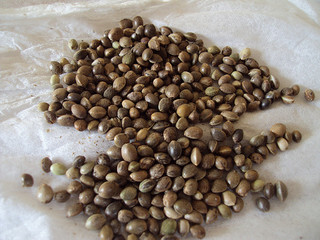 The seeds are used to in salads and to made into oil and flour. Aladdin used hempseed oil in his lamp as well as the Prophet Abraham. Also, the crushed seeds, mixed with sugar and water, are drunk as a horchata. Toasted, the seeds may be eaten as a snack. They are eaten as a dessert when crushed. There is also hempseed bread, which was thought cold and dry and could be eaten without fear according to Avenzoar. A medicine of oil from the seeds and resin extracted from the plant was used in Spain as a sedative and for its hypnotic affects. Squeeze a lemon. Remove the out leaves from the artichokes. Wash them and slice the artichokes and the stems, making thin strips. Boil them for about 20 minutes. When soft, strain off water. Put them in a large bowl and cover with the lemon juice from the second lemon to prevent browning and chill. Make a marinade, whisking together the olive oil, garlic, salt and pepper. Set aside. Prepare the onion and parsley; set aside. Squeeze the third lemon. Place the juice and the rind in a bowl of water. Prepare the artichokes by removing outer leaves. Peel the stem. 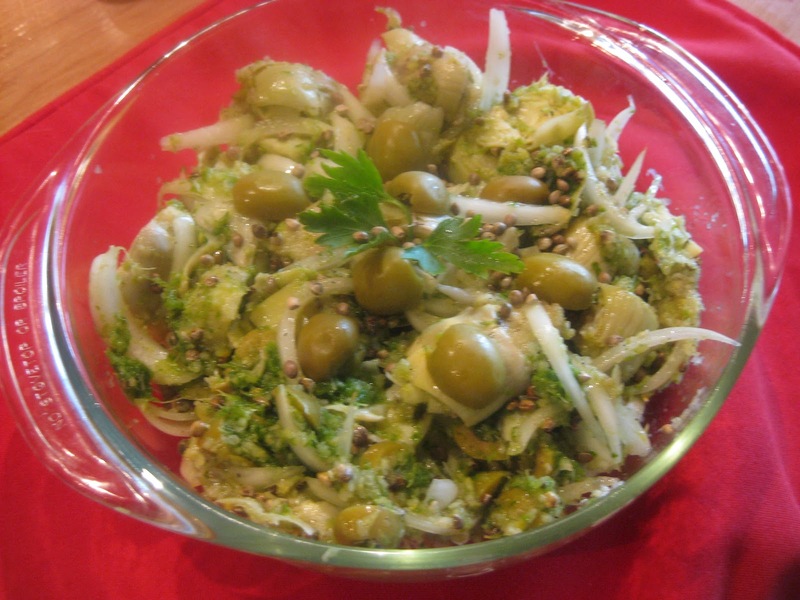 Place the artichoke hearts and stems in the bowl of lemon water to prevent browning. Add the onion, parsley, hempseeds and olives. Pour the marinade over this and toss. Garnish and serve. hi suey, sounds delicious! 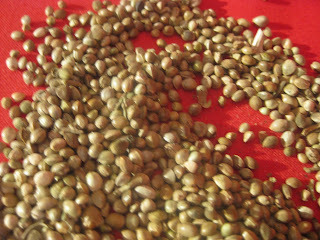 now if i could just find hemp seeds in santiago! do you have a source where you purchase them in chile? or how DO you get them?? I bought these in L a Vega, no problem. thank you! do you by chance know the stand #? I am sorry I do not recall which stand but it was one where you find barrels of barley, oats, rice etc. I remember the first stand I tried did not have it but they suggested the one where I found it.